Cowboy music including "Don't fence me in" and " I'm Back In The Saddle Again" greeted the audience as the 99 seat Threshold Repertory Theatre in downtown Charleston, SC was seated to see John Steinbeck's classic " Of Mice and Men". This is Charleston's professional theater company and their attention to detail is outstanding. This production was in Association with Actor's Theatre of SC. Coincidently "Of Mice And Men" was entertaining Charleston theatre-goers at the same time as Powerball grew to the billion dollar level producing a get rich quick mania fueling the American dream. One of the lottery ticket holders said it all " I didn't expect to win, but I had big dreams." Living the dreaming drifter's life as main characters Lennie and George did, personified that familiar quest. This theme permeated the play. 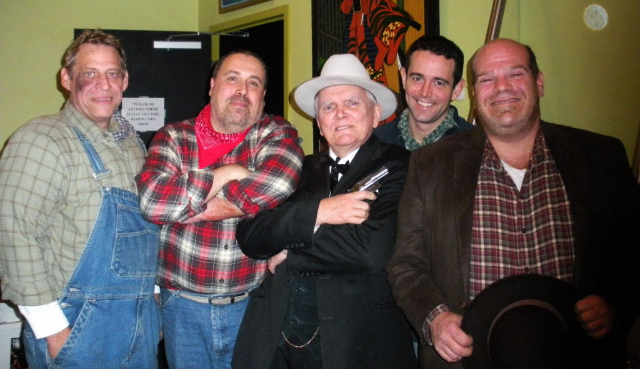 Multi-talented director Chris Weatherhead cast "Of Mice And Men" to perfection. Every actor resonated in their parts and made one feel they were truly the character that they were playing. We were mesmerized as the play captured the essence of friendship in a "Hell or High Water" mode. True friends that watch each other's back are more precious than gold. Lennie, the strong mentally challenged teddy bear who is capable of killing you with kindness was played magnificently by Daniel Jones. His body language was so expressive adding to dramatic chemistry with his friend. George was the handsome, level-headed realist of the odd couple. He had the look of an actor with movie star, leading-man quality. Philip Gajewski as George was sensational! Many of the conversations between George and Lennie stayed in my psyche just as a memorable song follows you home when you attended a musical. Most of the play took place in the bunkhouse where Lennie and George slept while doing chores on the farm during Depression Times as migrant workers. The supporting cast made their entrances in this bunk house. There was the most glamorous Tart , Curly's wife who tantalized the farm hands flaunting her sexuality just to get some attention and affection that her very jealous husband held from her played by Daniella DeRobbio . Curly was rambunctiously played by Mike Kordek who kept whizzing in and out of the bunkhouse in a constant frenzy. He was the boss's son so he felt enormously privileged and superior to the hired help. Slim, played by Paul O'Brien, was indeed svelte and handsome with a kind heart who was one of the farm supervisors who understood the relationship between Lennie and George. He provided support to help save the dignity of troubled Lennie. Boss Fredric DeJaco pranced around the stage maintaining control over his farm hands in a strict unemotional, boss-like manner. Glenn Orange played Whit as it was his first performance in a tragedy. Terry Koster played Carlson and Nat Jones was Candy, the one-handed cook who had a lot of stage time while aptly remaining in character. By the way, I particularly enjoyed Kyle Taylor's performance. He's in this show as Crooks who limped around with a broken back in his own private bunkhouse because segregation was evident at the time of the Depression. Moral of the story: Life is better when its shared. So plan to enjoy this theatrical adventure with someone who contributes significantly to your quality of life. Thanks to Chris Weatherhead for a production that puts another feather in your cap of theatrical accomplishments. Sandy Katz is a member of American Theater Critics Association (ATCA) and International Food Travel and Travel Writers Association (IFW&TWA).